Learning Labs are beginning to feature in many of today’s academic institutions. They are an environment for information sharing, creativity, gaining new knowledge and skills and developing solutions. They were originally designed for communities as a platform for local entrepreneurship however they are now more widely adopted by schools as a place for learning, innovation and invention. Dundee & Angus College are developing a space on the ground floor of their main campus which will include sports facilities, an Enterprise space and a Learning Lab. The Learning Lab will be a space for testing new technology, trying new hardware and software and learning how to employ these new skills. I have been asked to design the Learning Lab’s exterior and interior space ensuring the finished design emulates a sense of creativity and innovation. The space I will be working with is 10 metres by 6 metres with 5 metres height, I wall will be against the college building. The space must contain a 20 metres squared contemplation space which can be situated anywhere within the space, 2 3D printers, a laser cutter, 5 mac computers and 2 long studio desks with seating for up to 16 people. The design should be inventive and futuristic. My aim is to produce a design solution that incorporates all the requirements listed in the specifications. I want my design to be modern, inventive and a place that can be used for a wide range of activities for people of all abilities. 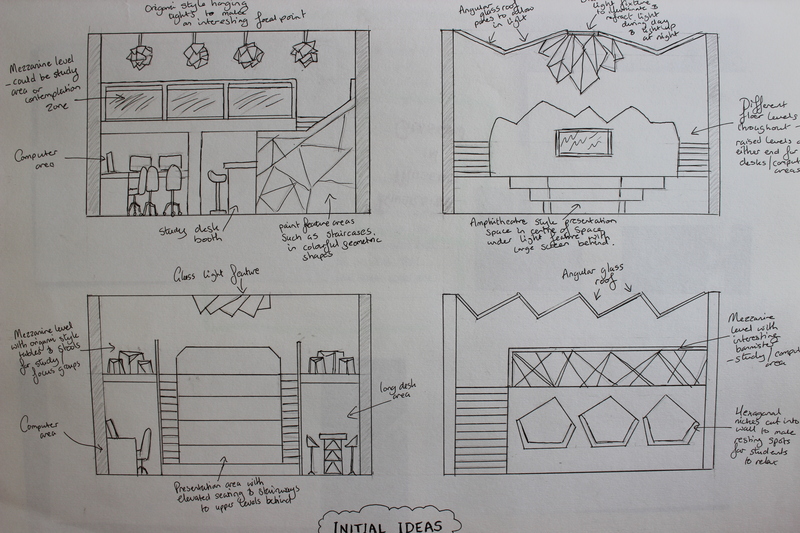 I will consider colour schemes, flooring, lighting and suitable layouts. To give it a bold, futuristic edge I will also consider origami and geometric style architecture in the way of angled walls & ceilings, roof hangings and glass walls. I began my project by researching similar learning environments including University hubs, libraries and creative office spaces. I also looked at Orgamic and geometric style architecture. After I had conducted my research I experimented with different ways that I could lay my space out and different ideas I could use including origami, kirigami and even geometric tree patterns. After some initial experimentation I decided to move on with an insect theme. I looked a different insect nest including beehives and I aslo looked at the geometric patterns of insect wings. For my final Learning Lab design solution I decided to go ahead with an angular, hexagonal shaped exterior, using plenty of natural wood and frosted glass in my design with an insect’s wing pattern across my glass facades. The contemplation/presentation area consisted of a tiered area in the corner facing a small presenting area with a smart board. The tiered area was intended for relaxing on as well as for being audience seating when a presentation was taking place. The rest of the lower level contained the desks, computer area and workshop with a more relaxed seating area located upstairs on a mezzanine level. It was relatively difficult to find much information on Learning Labs, with it being such a modern concept. I decided instead to research similar type establishments including student social areas, University hubs & libraries as well as top office working environments from around the world. From my research I found that wooden flooring and more natural environments provided a more ideal place in which to work. This led me onto designing concepts that included geometric patterns found in nature and eventually the beehive and insect wing design solution. I also looked at design psychology including colour. Bright, bold colours provide more stimulation when it comes to working environments. Yellow for example works well in invigorating the mind when it comes to learning new things but too much of it can be difficult to process. Red is good for making you pay attention but too much of it has connotations with danger and aggression whereas blue is a good calming colour. I decided to adopt these primary colours in my final design solution but only in small doses in the furniture and wall art. The rest of my design would be lit up my colour changing lighting so adaptable to the function being used at the time as well as being aesthetically pleasing. I thought this would give my design a more innovative, futuristic look. I met all the requirements of the brief and even managed to put in some extras. I had 6 mac computers sitting around a hexagonal column. The 2 3D printers were situated on a unit to the side of the computers which allowed for small storage too. There was desk seating for 16 people as well as required in the brief. This furniture was modular with 2 high stools per hexagonal desk of which there was 8 in total. I designed it this way to the desks could be arranged in different ways i.e. they could easily be pushed together or just in pairs for small group work if required. The tiered seating area and stage maximised full use of the 20 metre square contemplation space. I also made use of the 5 metre height by putting in a mezzanine level above the classroom area. The mezzanine level consisted of more relaxed seating including casual stool and table area as well as hexagonal shaped recesses into the wall which could be used as ‘book nooks’. Under the stairs leading up to the mezzanine level was a workshop room which contained the laser cutter and extra computer with which to operate it. Here are the images of my final design on SketchUp.